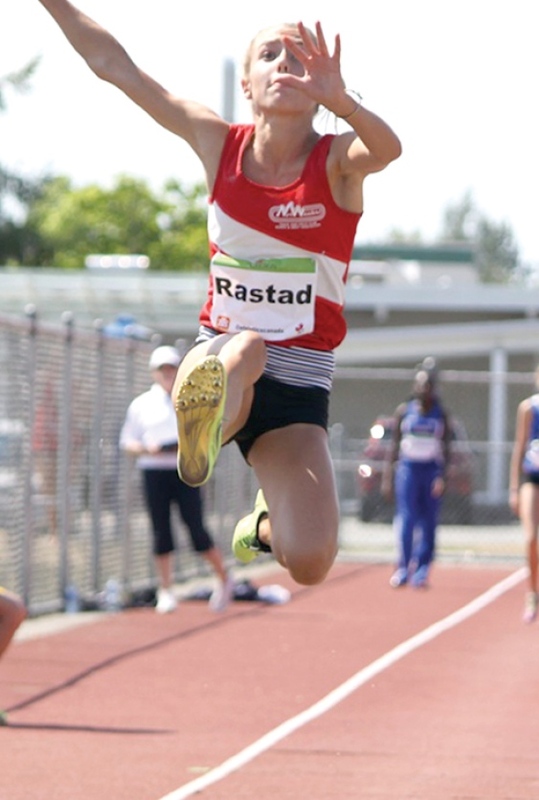 NORTH SHORE NEWS – A pair of long jumpers led the way as four athletes from the North Shore’s NorWesters Track and Field Club took home medals at the Legion National Youth Championships held last month in Langley. Emma Rastad won gold in the girls U16 long jump with a leap of 5.61 metres while Diana Voloshin claimed the girls U18 long jump with a 5.56 m attempt. James Elson won a pair of medals, finishing second in boys U18 high jump after clearing 2.01 m and earning bronze in triple jump with a leap of 13.42 m. Nima Parsakish rounded out the medal haul with a silver medal showing in the boys U16 1,500-m racewalk, clocking a time of 9:41.47. Kate Weaver placed fourth in girls U18 heptathlon. Victoria, BC – Saturday, Augusts 31st – Two age-group records were broken at The Q’s Victoria Run Series’ final track meet of the 2013 season. The event took place at the University of Victoria’s Centennial stadium. Marilyn Arsenault of Victoria won the women’s 10000m event at the Maude Hunter’s Pub BC 10000m Championships by running to a Canadian age-group record time of 34:18.21. This is Arsenault’s second Canadian age-group record, as she bettered her time from the same event from 2012, where she ran 34:22. Arsenault was using the race as a fitness indicator towards her effort to compete in the Toronto Scotiabank Waterfront Marathon. Her goal will be to run under 2:40 and perhaps attain the 2014 Glasgow Commonwealth Games standard. Two-time Olympian, Bruce Deacon, also of Victoria took the BC 45-49 age-group record for the distance, finishing in 31:55.92. Deacon finished second to two-time Canadian Marathon champion Jim Finlayson. Finlayson crossed the line in 31:31.12. Third went to former University of Victoria Vike, Craig Odermatt who finished in 32:20.60. The first three finishers – the gold, silver and bronze medallists – in the men’s race are all master-age athletes (over 40), while Marilyn Arsenault is also a master. There were three races on the evening’s schedule including two 5000 metre events. The first 5000m race started at 6:30 PM and was won by two athletes who compete in the 60-69 age-category, Frank Towler and Martha McNeely won the men’s and women’s division. Towler ran 21:44.99 and McNeely finished in 26:54.70. In the second 5000m event of the night, Chris Galley won the men’s race in the time of 17:01.74, while Courtney Cameron won in 19:56.19. Results are located at http://www.victoriarunseries.com. The Q’s Victoria Run Series includes five track meets, plus two road races for the 2013 season. The final race on the schedule is the Synergy Shuffle, happening Sunday, September 15th at 11:00 AM. The Synergy Shuffle includes three distances to compete in, 10, 20 or 30kms. The races start on Lochside Trail at Island View Road, next to Michell’s Farm Market. The final event of the 2013 season is the season wrap-up silent auction and awards party that takes place at the Sticky Wicket’s Maple Room in the Strathcona Hotel. Proceeds from the series go to the Mustard Seed Food Bank. Kamloops This Week – Dylan Armstrong took time to reflect on his bronze-medal win in shot put at the World Track and Field Championships in Moscow before making his way across Europe. “I celebrated with a few friends from various countries,” Armstrong told KTW from Slovakia on Tuesday, Aug. 20. His coach, as many Kamloopsians know by now, is Anatoliy Bondarchuk, an intriguing 73-year-old fellow from the Ukraine who coaches in the Tournament Capital at the National Throws Centre. Armstrong threw a season-best 21.34 metres to capture bronze at Luzhniki Stadium on Friday, Aug. 16. The medal was one of five earned by Canadians in Moscow — making it the most successful showing in the country’s history at the world championships. Armstrong said there are about eight European competitions left to attend on this year’s schedule, including two International Association of Athletics Federations Diamond League events, the next one scheduled for Thursday, Aug. 29, in Zurich, Switzerland. The Kamloops Blazers are interested in honouring Armstrong’s accomplishments at a game this season. With the International Olympic Committee expected to award Armstrong with retroactive bronze from the 2008 Summer Olympic Games in Beijing, the WHL club will likely wait until that happens to hold a ceremony. The last Diamond League event of the 2013 season will be held in Brussels, Belgium, on Sept. 6. LANGLEY TIMES – It wasn’t an easy task to get to the Legion Canadian track and field championships, but Alexander Savage ended up right where he wanted: atop the podium with a gold medal draped around his neck. The 15-year-old from Langley leaped a personal best 6.66m — bettering his previous mark by 35cm — to take gold in the midget (16 and under) long jump at McLeod Park over the weekend. Not bad for an athlete who had to be convinced by his father, Mike, to pay the entry fee and give it a shot at the Legion championships. “He told me I had put so much time into it, I should go do,” Savage recalled. Savage’s hesitance to enter stemmed from the fact he had gone to Kamloops last month with the intention of earning his way onto the Team B.C. roster — which would have waived his entry fee for the Legion championships. To earn a spot, Savage needed to finish top-two in his event, and he thought he had with a leap of 6.00m. But when the roster was later announced, the teen found out his best jump had been deemed illegal and voided. Savage said he was shocked at what had transpired but finally agreed to pay the entry fee and compete on his own. He trains with the South Fraser Track and Field Club and coach Robert Esmie although it was just Savage and his father working on his long jump out at McLeod. He also credited Flip City Gymnastics owner Rusty Pearce, who helped him working on his jumping technique and getting used to rotating his arms while he was in the air and keeping his balance. And it all came together on Sunday, the final day of the Legion championships. Jumping with what he called “a little chip on my shoulder”, Savage won the gold with a leap of 6.66m. The silver medal went to Team Quebec’s Ivan Nyemeck (6.57m) while Team Manitoba/Northwest Ontario’s Thomas Walser (5.99m) won bronze. Savage is a newcomer to the sport, only taking up track and field seriously, this past May. He also plays basketball with the Walnut Grove Gators junior boys’ team. Entering Grade 10 next month at Walnut Grove, Savage plans to pursue both sports to see where they will take him. LANGLEY TIMES – One can only imagine what Hannah Rolfe been able to do had she been healthy the past three months. Just cleared last week from a concussion she suffered back in May at the Fraser Valley championships, the 15-year-old Langley girl not only won the gold medal in the midget (U16) high jump at the Canadian Legion track and field championships, but she set a new personal best in the process. The Legion championships — which saw close to 1,000 of the top track and field athletes between the ages of 12 and 17 — ran from Aug. 9 to 11 at Langley’s McLeod Park. The high jump was held on Sunday, the final day, and Rolfe was representing her club, the Langley Mustangs. Rolfe, who enters Grade 10 at Walnut Grove Secondary next month, suffered the concussion during the Fraser Valley championships during the high school season. Rolfe hit her head on the high jump standard, the pole on either side of the mat which hold the bar in place. It knocked her out of the competition and the following months can best be described as very trying. Rolfe said what motivated her was the hope she would get better and be able to compete, as well as the support from those helping her, such as her physiotherapist, masseuse and chiropractor. Finally, just two days before the competition (Aug. 7) she was cleared to compete. This came after she had a practice session the week before and the symptoms did not return. And while she would not have minded getting the chance to travel to another part of the country for the competition — “I was a little disappointed” — the whole experience of the Legion championships was enjoyable. She also soared to a new personal best, clearing 1.67m to capture the gold medal. Her previous best had been 1.60m. Her jump was 0.6m better than Team Ontario’s Brett Belanger, who cleared 1.61m. Another Ontario jumper, Tess Verhoeven of the London Legion, was third at 1.58m. “I felt really confident going in to the competition but I did shock myself to do as well as I did,” Rolfe said. Four Kamloops Track and Field Club athletes had notable performances at the Legion Youth National Track and Field Championships, which wrapped up in Langley on Sunday, Aug. 11. Kendall Fitzgerald won silver in the midget girls’ 1,500m steeplechase and placed third in the 2,000m race. Fitzgerald has the fastest midget girls’ 2,000m time this year in B.C. Braden Derker won silver in pole vault and Alex Smith placed fifth. Both athletes are coached by Ryan Jensen. Bryce Turner placed seventh in the midget boys’ 1,500m steeplechase and 12th in the 2,000m race. Turner and Fitzgerald are coached by Bruno Mazzotta. It was a memorable summer personally for Cam Levins, who got married on Canada Day in Victoria at St. Ann’s Academy. But it was highly forgettable on the track. The runner from Black Creek, who will be among the big Canadian and Island hopes at the 2016 Rio Summer Olympics, has dropped out of today’s 5,000 metres at the 2013 IAAF world track and field championships in Moscow after his disappointing 14th-place finish in the 10,000 metres Saturday. Little known coming out of G.P. Vanier Secondary in Courtenay, Levins only got a U.S. NCAA offer after scouring the Internet. He seemed to come out of nowhere last year with Southern Utah to sweep the 2012 NCAA titles in the 5,000 and 10,000 metres before making the finals in both those events at the London Olympics. Now training under the former great runner Alberto Salazar, he doesn’t plan on having any more of those. Meanwhile, fellow Islander and Olympic finalist Mike Mason of Nanoose Bay begins competition in the high jump qualifying rounds today with the final scheduled for Thursday. Only a quivering bar, that eventually dropped, denied the graduate of Parksville’s Bellenas Secondary a bronze medal last year at the London Olympics.